Larry joined the International Taiji & Shaolin Wushu Association after becoming disillusioned by the commercial approach of the Contact Karate that he had pursued for three years since 1981. He came to Carlton Forum Leisure Centre in Nottingham seeking out a Taiji class to balance the physical aspects of the Karate. Being tight with his money, he realised that he could study something called Wing Chun and the Taiji for one lesson fee! So, rather by default, his practice of the Chinese arts began. He trained each Sunday night under Derek Frearson, and elsewhere in Nottingham with his Kung Fu elder brothers during the week. Having a black belt already he felt no pressure to grade and none was applied. He abandoned the Karate for the lifetime study that is Gung Fu and eventually graded Black Sash in 1988. During this time he attended seminars with Ip Chun learning the Pole and Sword forms. On opening Joint Effort Fitness Studio in 1990, he applied for permission to open a Wing Chun School for the Association, and made the progress that comes with daily access to the Mook Jong, from the questions and misinterpretations of his students, and the need to fill 1.5 hours of activity twice a week! He expanded his activities to include teaching Self protection and other Chinese martial arts and Eastern health practices, plus fitness activities. 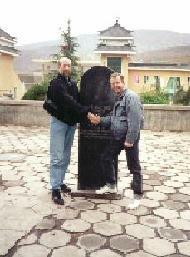 In 1994 Larry traveled to Hong Kong, Shaolin and Foshan with Derek's infamous China Tours. Apparently these are advertised as health tours in some quarters! Late nights, early mornings, excessive pijou, perilous transport and questionable food must be good for you! Still he must have liked the training because he returned to England, sold his precious motorbike and went back with Derek the very next year. When abroad Larry concentrated on improving his Taiji with Master Ou Ron Ji, student of Yang Zhen Ming and Foshan Wing Chun Kuen with Master Lun Kai one of Yip Mans original students.. He has also learnt a little of the Pao Fa Lien Wing Chun with Sifu Leo Man. Larry teaches Wing Chun, Tai Chi, Qigong and self defence at Beeston Gym and from his own home, though in the past he has run classes at various FE colleges. Through them he has taught in such varied situations as to a Prostitutes Collective, and to other women's groups - both college staff and Asian groups.In the mid `90`s, Larry taught Taiji to many F.E. Students including groups with mental health problems, which he found to be most rewarding. Larry has also assisted his Kung Fu elder brother Mick Yates with his Wing Chun classes at Bakersfield. The recent years have given Larry much more time to practice, but with Derek's influence, his kung fu elder brother Mick Yate's practical approach, plus the afterglow of the China tours, he feels he has been in a very creative and productive period and that the students have definitely benefited. Some have been with him over 20 years. For his own development he has the last few years, applied himself to further internalising his martial arts and qualifying in Tuina massage. Despite training for 34 years and teaching for over 25 Larry is still taking private lessons and attending seminars with acknowledged authority figures, such as his Sifu Derek Frearson when the Association organises their Chi Sau Exchange Days, with his kung fu elder brother and with his kung fu uncle Yun Choi Yeung. 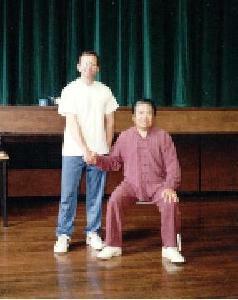 He is pictured below on seminar with Fu Sheng Yuan, son of Fu Zhong Wen, Chief disciple of Yang Chen Fu. 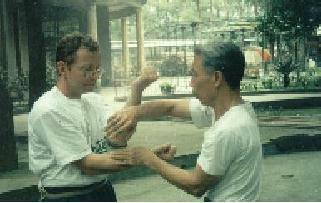 Below that he is shown applying a Pao Fa Lien Wing Chun technique with a class student.